Home » 2011 » June » 23 » How does the nuclear pore complex work to transport material in and out of the nucleus? The pore serves as a water filled channel and has an effective diameter of 10 nm. Therefore, transport in and out of the nucleus can occur in several ways. This concept is important because it means that mature ribosomes (with both subunits joined) cannot reenter the nucleus. Therefore, protein synthesis (translation of mRNA) must occur outside the nucleus. 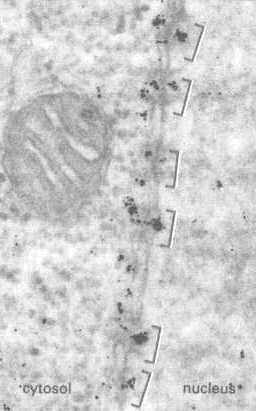 This form of transport is assumed when molecules larger than the pore diameter (10 nm) get into the nucleus. Studies with gold markers show that the pore can actually dilate up to 26 nm when it gets the appropriate signal. To understand the process, we need to answer the following questions. What tests can be used to prove a given signal allows transport? How does one prove that transport occurs via "active transport", i.e., requires energy or ATP)? Before you continue, think about these questions. How would you find and test signals, cytochemically? How would you prove that the signal was valid? Finally, how would you prove that the process requires ATP? In the following sections, we will illustrate experiments that were done to answer these questions. Studies have shown that the signal is in the peptide sequences. These are recognition sequences rich in lysine, arginine, and proline. Signal may control direction of transport: Gold-labeled tRNA or 5S RNA may leave the nucleus, but may not come back. Also, transport of RNA is inhibited by alteration of the 3' end or the 5' cap structure. What tests can be used to prove a particular signal? A peptide sequence, called nucleoplasmin, was isolated and linked to colloidal gold. It was then injected into an oocyte and traced with electron microscopy. As shown in the figure to the left, the gold particles mark the site of transport of the nucleoplasmin and the studies showed that it was transported into the nucleus. Small gold markers are evident inside the nucleus. Figure was taken from Alberts et al., Molecular Biology of the Cell, Garland Pub., N.Y. 1994, Fig 12-15. In another test, workers took advantage of the fact that nucleoplasmin has a head region which is not transported into the nucleus and a tail region which is transported. When the heads and tails were separated and each linked to gold, only the gold-labeled tail region was transported. Gold-labeled head regions remained in the cytoplasm. In a test of T antigens of the SV40 virus, if the sequence is altered by even one amino acid (see figure below), the peptide is no longer transported to the nucleus. This is shown in this figure. The studies used immunofluorescence to detect either the native or the altered sequences which were conjugated to fluorescein. Note that only the native peptide could enter the nucleus. The light, fluorescence micrograph on the left (A) shows entry of the native peptide into the ovoid nuclei. The micrograph on the right (B) shows no entry into nuclei. The altered peptide stays in the cytoplasm. Figure was taken from Alberts et al., Molecular Biology of the Cell, Garland Pub., N.Y. 1994, Fig 12-13. Finally, one can follow the exit of mRNAs by complementary DNA or RNA probes that detect Poly (A)+ RNA. This probe can be linked to biotin, radioactive label, or digoxygenin. It is then detected cytochemically. How does one prove that transport requires energy (or ATP)? Transport of mRNA can be inhibited by cooling the cells (placing them at 4 C). ATP Hydrolysis is required to import a protein into the nucleus. In the absence of ATP, the proteins bind specifically at the cytosolic face of isolated frog oocyte nuclei. When ATP is added, the proteins are allowed to enter. This can be traced with colloidal gold labeling of the proteins. Studies show that ATP is needed for entry, but not for binding to specific receptors.